I would think there are less photogenic activities Russia's president could initiate that would benefit the endangered crane. The Siberian cranes are in rapid declinewith estimated numbers in the region of 2,900-3,000. Their listing as critically endangered is the highest category of threat before extinction used by the International Union for Conservation of Nature (IUCN). Putin has communed with wild animals several times as part of an effort to create the image of a clean-living, nature-loving person during his 12 years as Russia's paramount leader. 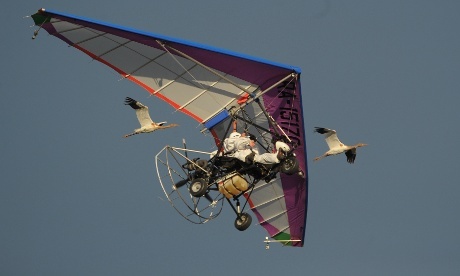 This time around, he donned a baggy white costume with a spacious helmet and goggles and flew in a motorised deltaplane light aircraft surrounded by several young cranes that were born in captivity in order to help introduce them to the wild. "They got used to it. They are not afraid, they are overtaking the deltaplane," a smiling Putin said after landing. "They are overtaking, approaching the wing from the left, from the right, from above. Well done. Beautiful guys. Cute. They are three months old but already quite big.